Burrows Cabinets is a builder-direct cabinet manufacturer. If you are a homeowner, please contact your home builder for options specific to your community. Some options are available only in select communities. Burrows Cabinets’ standard drawer boxes are made using 5/8″ thick, maple overlay subfronts, backs and sides with maple-overlay PVC on the top edges. The construction is rabbited dado, with a flush bottom for standard applications and an inset bottom for heavy item applications such as pot and pan drawers and pull out pantry drawers. The drawer bottom is 1/4″ thick maple overlay on an MDF core. This drawer box is only offered in pre-finished cabinets. 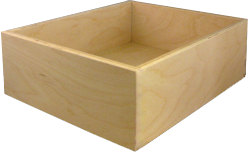 Burrows Cabinets’ first level upgrade drawer box is made using 1/2″ thick, 9-ply Baltic birch material, manufactured with dado construction. The top edge is sanded smooth. When specified as “paint grade” the drawer box will have a 1/4″ Hardboard bottom. When specified as “unfinished” the drawer box will have a 1/4″ plywood bottom. 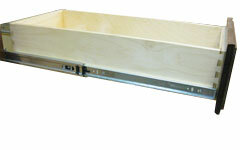 All drawers using undermount guides are 1/2″ Baltic birch material only. Burows Cabinets’ top-of-the-line drawer box upgrade is a solid, 5/8″ thick maple dovetail drawer box. This solid dovetail box gives your drawer boxes a look that is beautifully detailed and shows the level of quality that has gone into your cabinets. The strength of dovetail drawer boxes is especially beneficial in heavily loaded silverware drawers, plate and pan drawers and any drawer where there is significant use and/or weight. Burrows Cabinets’ standard drawer guides are rated at 75 pounds and offer dependable performance, function and durability. These drawer guides are white, epoxy-coated and are 3/4 extension. They feature smooth-running, synthetic rollers on tempered steel axles, which provides a quiet, smooth rolling action as well as easy drawer removal. Burrows Cabinets’ first level upgrade drawer guide is made using ultra-durable steel and is a side mount, full-extension guide with 100 lb capacity. This upgraded drawer guide is roll-formed for a smooth, quiet roll and has patented, self-adjusting, floating wheels for dependable tracking and performance. These heavy-duty, full extension guides give you complete access to the contents even at the back of the drawer. Burrows Cabinets’ top-of-the-line drawer guide upgrade is mounted directly underneath the drawer box, putting the heavy-duty, steel hardware out of sight, and allowing you to view the craftsmanship of your wood drawers. These Blum undermount guides feature soft-close technology that absorbs the shock of the drawer closing, creates a quiet environment and makes closing the drawer smooth and effortless. The full extension gives you complete access and visibility to items at the back of your drawer.